Did you came here without a clue about the topic that is to be discussed in the following page? Did you just saw the link on facebook and clicked in to see what’s going to be said here? 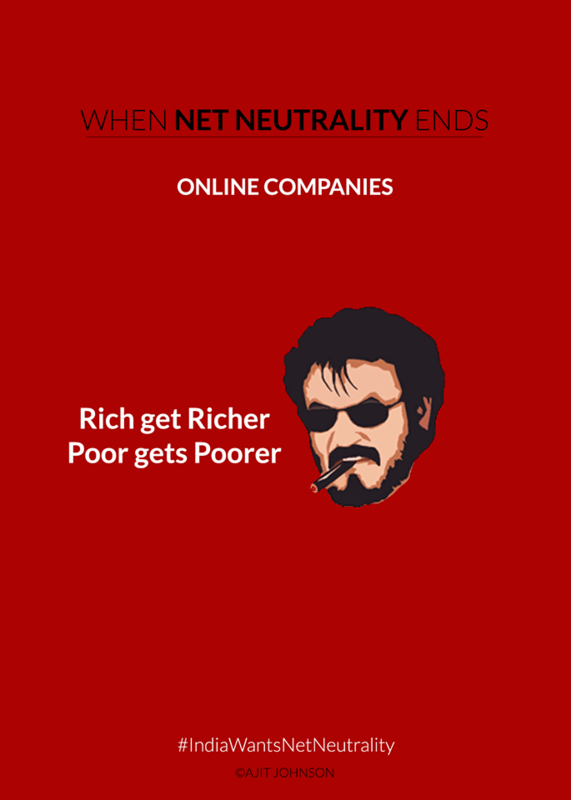 Do you have any idea about net neutrality? Did you know about the future problems that we are going to face from the internet? Do you want to stay connected to the internet each and every day? Then we welcome you to read this post. This is an awareness post about the net neutrality, a topic that has been highlighted and is at the peak in recent days. It is going trending on social media and we feel every internet user should be aware of it. We welcome you to join the net neutrality protest. 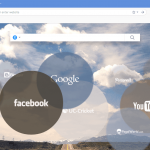 In simple words, the ability to browse the internet freely. You just pay for the internet service you want to avail. There’s no need to individually pay to any service you avail using the internet. Yup, of course. Net neutrality just only asks your rights for freedom of internet everywhere. You should be able to browse internet at equal speeds all the time. Whether you play an online game or watch a video or download a file, it should consume equal amount of internet bandwidth. Net neutrality also asks for your right to use the internet just the way you want. Imagine a world where you have to pay for facebook or twitter or youtube individually. How would you cope up? 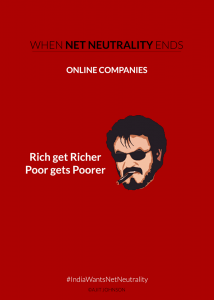 You paid for the internet right? Then you should have the right to utilize it fully. 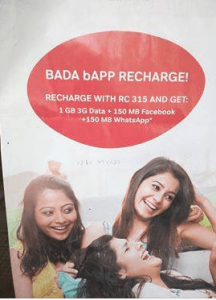 Recently a telecom operator launched the bada baap recharge pack where you have to recharge with Rs315 to get 1GB 3g data. Along with this you will get 150MB Facebook and 150MB Whatsapp. Now here comes a question: Why 150 MB only? Didn’t you purchase the data pack of 1GB? Then? 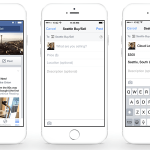 Why should your whatsapp and facebook data usage be counted separately? It’s all using the same bandwidth. This is unwanted and undesired. Net neutrality asks your rights for freedom of anonymous data usage. 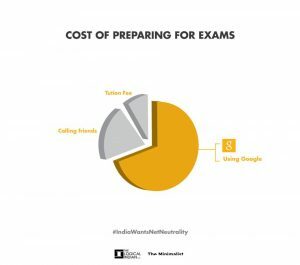 If you are paying for the internet, you should get the data for everything that is available on the internet. 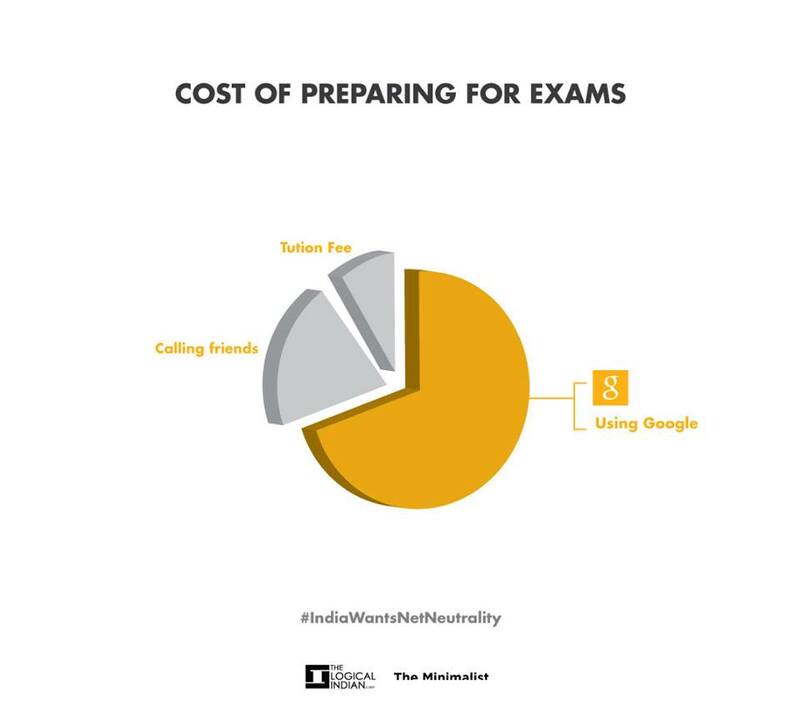 Imagine a scenario, where you are paying Rs55 per year for accessing whatsapp, then you are paying money for the internet, then too you have a limited data for whatsapp? Is this justifed? 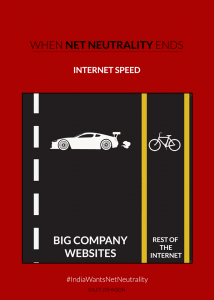 Famous author Ajit Johnson has illustrated Net Neutrality in his best way through his facebook post. We have added the images to convey the message in a better way. 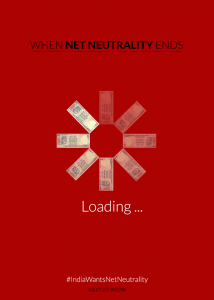 View the images and you will get to know the effects of net neutrality. Have a look. The Logical Indian also tried to illustrate net neutrality with their facebook page post. Have more confusions? 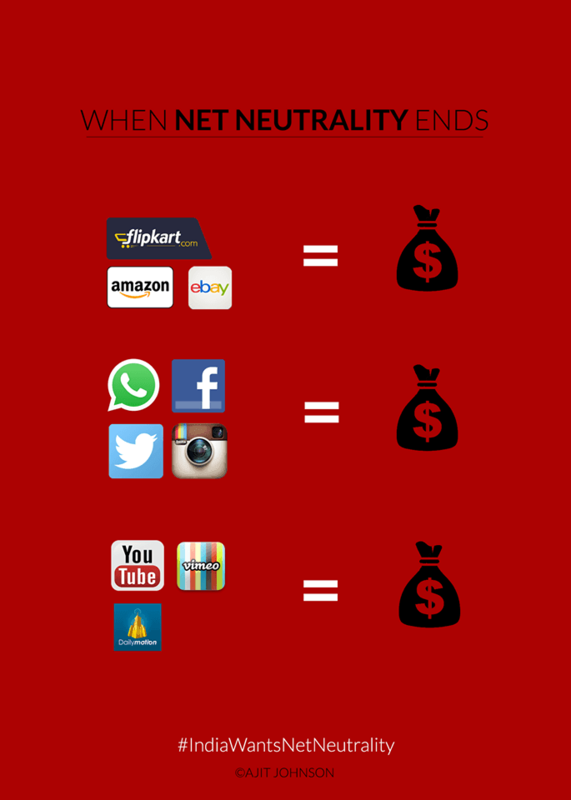 Watch this video instead to have a clear idea about net neutrality. This video is made by the popular YouTube channel: AIB. 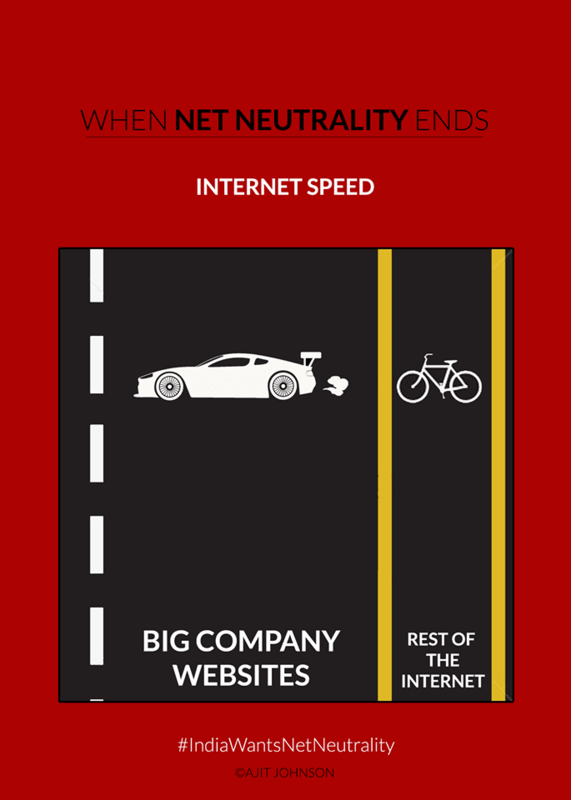 They tells you in details about net neutrality, beautifully explains you with the help of infographics, and makes you aware of net neutrality. 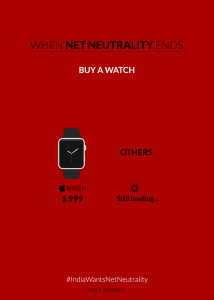 Well if you truly want net neutrality and wanna support it for your country, then you just need to act fast. 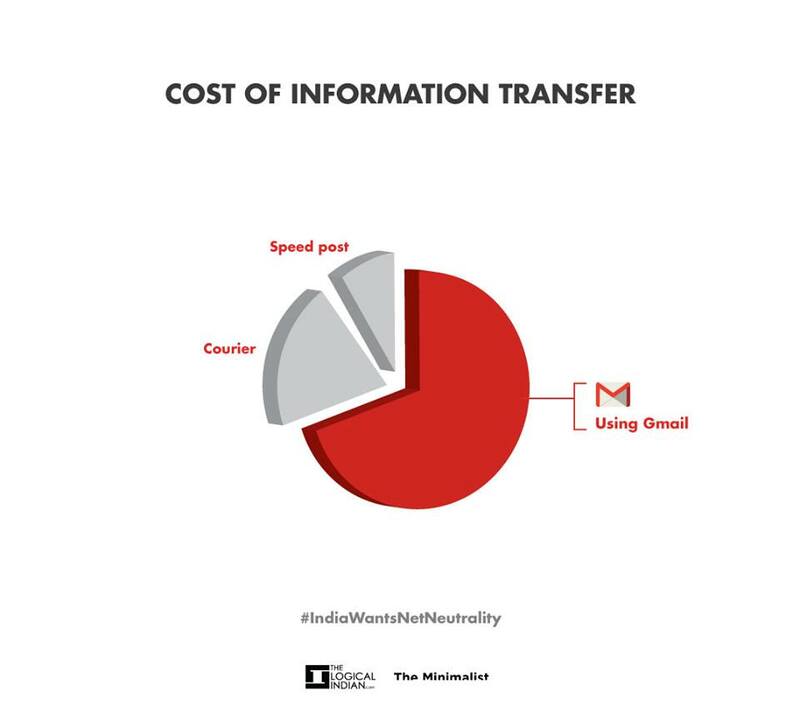 You need to send an email to the TRAI stating that you want net neutrality. 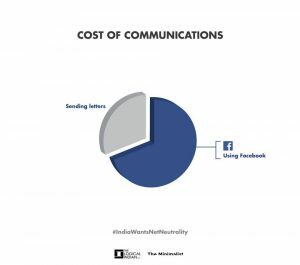 But its not that easy to frame it up and write the email. TRAI has set up 20 questions related to net neutrality and given a deadline of 24th April to answer them in the email. But that has been made easier for you. An website called http://www.savetheinternet.in/ has been made where you just need to copy the email text and finally send it to TRAI. If you are from pc, you can get a direct link to open the composed email on gmail and send that. 3. It will automatically copy the content to be mailed to TRAI with all 20 Questions and thr Answers too. 4. Select your Email Service Provider, it will redirect you to the respective Email site and New Email tab will Pop up with Subject, Email ID of Recipient, etc. 5. Press ‘Ctrl V’ on the main body of Email (Content is already Copied during Step 3). 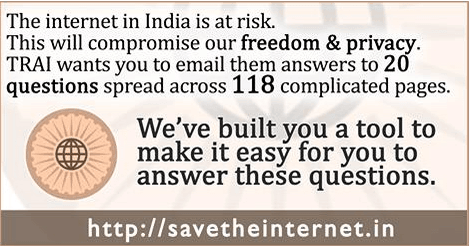 You can directly send the email which they have made or you can edit the answers to the questions asked by TRAI. Question 1: Is it too early to establish a regulatory framework for Internet/OTT services, since internet penetration is still evolving, access speeds are generally low and there is limited coverage of high-speed broadband in the country? Or, should some beginning be made now with a regulatory framework that could be adapted to changes in the future? Please comment with justifications. Question 2: Should the Internet/OTT players offering communication services (voice, messaging and video call services through applications (resident either in the country or outside) be brought under the licensing regime? Please comment with justifications. Question 3: Is the growth of Internet/OTT impacting the traditional revenue stream of Telecom operators/Telecom operators? If so, is the increase in data revenues of the Telecom Operators sufficient to compensate for this impact? Please comment with reasons. Question 4: Should the Internet/OTT players pay for use of the Telecom Operators network over and above data charges paid by consumers? If yes, what pricing options can be adopted? 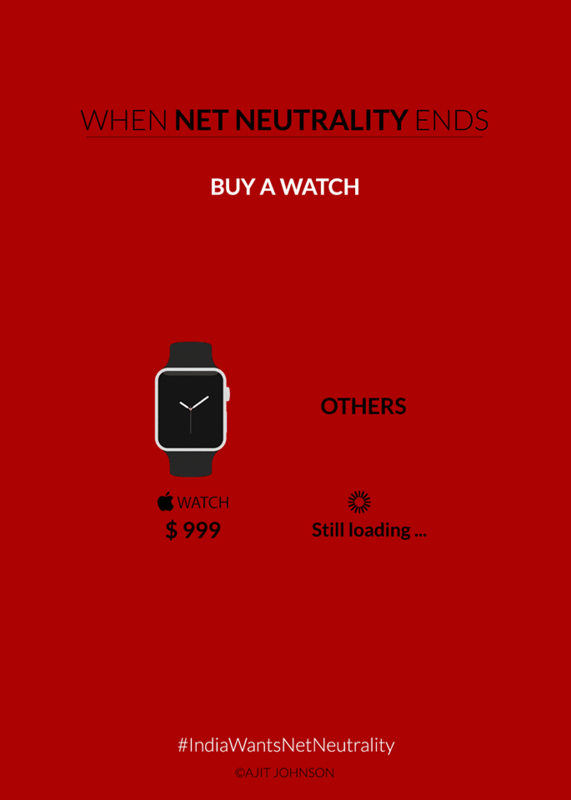 Could such options include prices based on bandwidth consumption? Can prices be used as a means of product/service differentiation? Please comment with justifications. Question 5: Do you agree that imbalances exist in the regulatory environment in the operation of Internet/OTT players? If so, what should be the framework to address these issues? How can the prevailing laws and regulations be applied to Internet/OTT players (who operate in the virtual world) and compliance enforced? What could be the impact on the economy? Please comment with justifications. Question 6: How should the security concerns be addressed with regard to OTT players providing communication services? What security conditions such as maintaining data records, logs etc. need to be mandated for such OTT players? And, how can compliance with these conditions be ensured if the applications of such OTT players reside outside the country? Please comment with justifications. Question 7: How should the OTT players offering app services ensure security, safety and privacy of the consumer? How should they ensure protection of consumer interest? Please comment with justifications. Question 8: In what manner can the proposals for a regulatory framework for OTTs in India draw from those of ETNO, referred to in para 4.23 or the best practices summarised in para 4.29? And, what practices should be proscribed by regulatory fiat? Please comment with justifications. Question 9: What are your views on net-neutrality in the Indian context? How should the various principles discussed in para 5.47 be dealt with? Please comment with justifications. Question 10: What forms of discrimination or traffic management practices are reasonable and consistent with a pragmatic approach? What should or can be permitted? Please comment with justifications. Question 11: Should the TSPs be mandated to publish various traffic management techniques used for different OTT applications? Is this a sufficient condition to ensure transparency and a fair regulatory regime? Question 13: Should TSPs be allowed to implement non-price based discrimination of services? If so, under what circumstances are such practices acceptable? What restrictions, if any, need to be placed so that such measures are not abused? What measures should be adopted to ensure transparency to consumers? Please comment with justifications. Question 14: Is there a justification for allowing differential pricing for data access and OTT communication services? If so, what changes need to be brought about in the present tariff and regulatory framework for telecommunication services in the country? Please comment with justifications. Question 15: Should OTT communication service players be treated as Bulk User of Telecom Services (BuTS)? How should the framework be structured to prevent any discrimination and protect stakeholder interest? Please comment with justification. Question 16: What framework should be adopted to encourage India-specific OTT apps? Please comment with justifications. Question 17: If the OTT communication service players are to be licensed, should they be categorised as ASP or CSP? If so, what should be the framework? Please comment with justifications. Question 18: Is there a need to regulate subscription charges for OTT communication services? Please comment with justifications. Question 19: What steps should be taken by the Government for regulation of non-communication OTT players? Please comment with justifications. Question 20: Are there any other issues that have a bearing on the subject discussed? These are the 20 questions asked by TRAI that you need to answer. 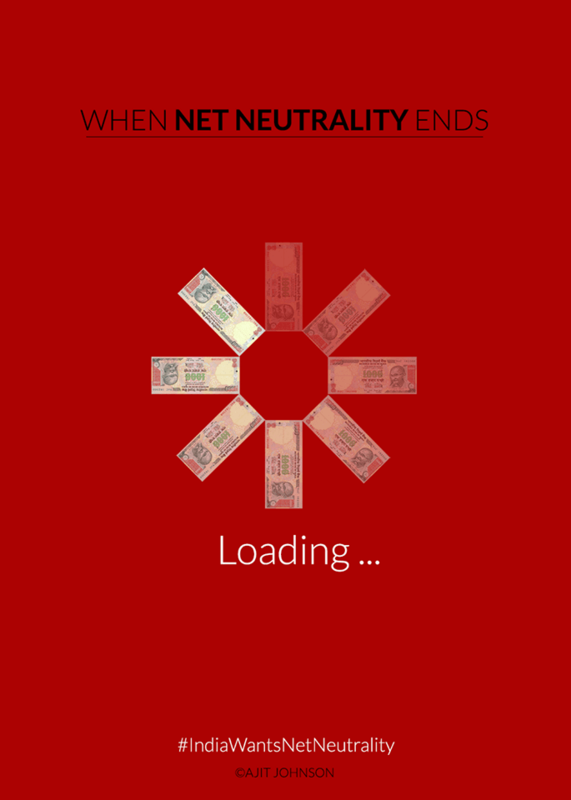 Go to http://www.savetheinternet.in/ and participate in the India’s most awaited net neutrality. Thanks for reading the post. Do share if you like it. Keep visiting HiTricks. How to create a for sale group on Facebook? Creo Mark 1 Specs & Features Review: Why it is NOT good to buy?